Hiring a vehicle for a special night out is no longer seen as such a prestigious thing. There was once a time where it was almost a stereotype that only the rich and famous could have a fancy car with a chauffeur to drive them around. But now a-days, it is a luxury that all of us are able to enjoy for those events in our lives that deserve to be celebrated in the most extravagant way. The Executive Limo Wedding Car Hire Rutland services are out of this world. For instance, your wedding. A once in a lifetime event that you will be remembering for the rest of your life. You will celebrate the anniversary every year and look back on the fond memories of the best day of your life. Everything needs to be perfect. Especially transportation to and from your wedding venue. How much more special would you feel if you were taken to the wedding venue in our 1956 Bentley S1, our our Rolls Royce Phantom or maybe our Beauford Tourer? You’d feel on top of the world from the moment your big day started. You would not have to worry about having a designated driver either as we have qualified chauffeurs to drive you wherever it is you want to go. All of our drivers and screened and trained in customer skills, so they will make you feel even more VIP. The Executive Limo Wedding Car Hire Rutland services only offer the absolute best for their client. Of course we do not only supply cars for weddings, any event that you see fit to hire a car for, we guarantee that we have the perfect vehicle that will make the whole night extra special. If you are unsure of what it is that you want for your event, then why not have another look through our website or get in touch and talk to one of our friendly customer service representatives who will be more than happy to help you organise everything you need for your transportation. You are can also decorate your vehicle of choice in a way that will match the colour scheme of the event. SO your wedding car will look the part, the graduation car can be in the school colours, we will go over and above to make sure that everything is perfect for your day. To book an Executive Limo Wedding Car Hire Rutland for your needs just give us a call. Discuss your needs with us and review our fleet. You are sure to find the best limo that fits your needs. We assure you complete satisfaction and the best prices. Our limos will make your special days even more colourful. 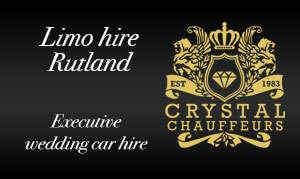 You cannot find a better place to hire your limos in Rutland. For a very impressive limo hire experience choose Crystal Chauffeurs and you will certainly be happy with your choice.